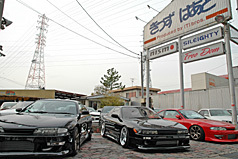 My main profession is managing a used car business called Kid's Heart located in the Gifu Prefecture. I've worked here ever since I was 21, so this year will be my 9th year here. I received the chance to start working here after being a repeating customer and getting to know the staff that worked there. My duties here include sales and vehicle registration. I don't do anything in regards to repair or maintaining the vehicles what so ever. In fact, they don't let me touch the cars because they say that when I do, I break them! One of my hobbies include computers, and since my friend hooked me up with a brand new laptop I've been making my own homepage as well as learning to use adobe illustrator. At first I barely even knew how to type and was curious how far I can get with a computer. Now, I ended up making a webpage for my work, Kids Heart and just started to design stickers using Adobe Illustrator. This lead to me opening up a graphics shop, T2 Koubou! Out of all this, I learned that a computer is one of my necessities in life. On my days of, I like to go fishing. Even on some work days, I sometimes get up early and go catch black bass and catfish here. However, there is a valid reason on why I only catch black bass and catfish. I'm deathly afraid of worms, so I can only catch fish that eat the lures. Another thing is that I can't even touch the fish that I catch! When I go fishing all by myself, I always struggle with this problem. I usually like to bring pliers to unhook the fish. I know, it's pretty sad. Generally I'm not very picky about what kind of food I love and hate but there is this one thing that I can't resist. For the past few years my love for Ochazuke (rice with tea and seasoning) has grown. 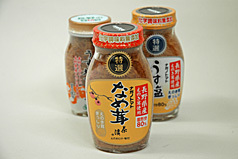 There are a lot of different types of ochazuke out there too, from the instant ones to the expensive ones. The type that I'm really into now is the basic type, where there are no special ingredients inside, just tea and fresh rice. One other type that I just can't get enough of is called Nametake (mushrooms) which is something readily available at my local grocery stores. However, I don't settle on just one type of Nametake, I have tasted over 10 different kinds so far. The one that is on the top of my list is made by Nagano Tomato, and it includes 80% nametake inside. The regular 60% are too light and watery for my taste. I can eat about 3 bowls of this with rice if I really wanted too. Am I weird? The first vehicle that I purchased in my life was the 4 door Crown. I quickly lowered the car and put new rims on but other than that, I didn't race or do anything wild with it. Then, I started to get interested in drag racing. I couldn't compete with my Crown so next, I decided to buy a Chaser (JZX81) which at the time had the highest rated horsepower of 280. So I bought that 280 horsepower Chaser and I went out to race but oddly enough, my 280 horses weren't enough to win out there. There, I learned that this car can be modified to go faster from increasing boost all the way to changing out the turbo. I dropped out of drag racing when I learned how expensive it was to go fast, especially how much it cost to upgrade to a single turbine. I'm still telling myself that this was a smart move at the time. But my love for cars still existed at that point, and decided to try drifting which one of my older coworkers was into. People told me that you can't drift a car with automatic transmissions but since that was the only kind of car I had, I went out there and tried it. Every night I went out and practiced drifting, tallying up my total gas bill to over 800 dollars a month! One month I even spent over 1,500 dollars on gas even. I went through 10 different cars from the Laurel (C33), Mark II and Chaser (JZX81), and Cresta (JZX90), all being 4 door. Looking back at this, I recently noticed that I tend to pick cars that have a lot of power and have big displacement. It's because I love the sound of the straight 6 cylinder engine. The happiest thing after becoming a D1 driver is that my family has accepted my choice in career. My family and parents approve of my drifting and that makes me extremely happy. What makes me happier is when they come to the race tracks and come cheer me on. It's also very satisfying and I enjoy being able to battle with the worlds best drifters. One battle that I cannot forget is the2 tsuiso battles against Masato Kawabata this season. The first one was at the D1 held at Ebisu Circuit where we fought through 4 sudden death matches. Although I lost that one, I never thought that the battle would last that long. The other memorable moment was the Fuji round of this year which is round 7. I was matched up against Kawabata in the finals, and both of us were fighting for our very first win. Again, Kawabata had won but it was a pleasure to battle him although honestly I really want to win next time. Drifting is a way to appeal myself to everyone. While appealing myself, it would also be nice if people can enjoy watching that as well. That's why I purposely drift out of bounds into the dirt or destroy my bumper, to please the crowd. Rather than focusing on setting a record, I would rather set a lasting impression. As the best form of automobile entertainment, I would like to continue doing my best in D1. 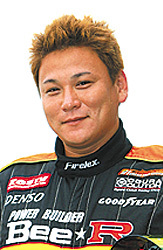 Tsuyoshi Tezuka has been entering the D1 Grand Prix series from the first round of the 2001 season. In 2005, he was picked up by Bee*R in their yellow machine. This flamboyant style of driving combined with the killer looks of the car always seems to impress the crowd. Tezuka works as the manager at the used car dealership called Kids Heart in the Aichi Prefecture. This lot features many cars that are sought after by many racers. Tezuka remains very busy everyday. Not only does he take care of sales, but vehicle registrations as well. A vehicle pickled out by a D1 contender should be second to none. He started using computers as a hobby but developed into a sticker making business and builds his own websites. Tezuka is a multi-talented man. Tezuka is currently in love with this canned mushroom. It's called Nagano Tomato 80% nametake. He tasted various different types of nametake to find this perfect one.